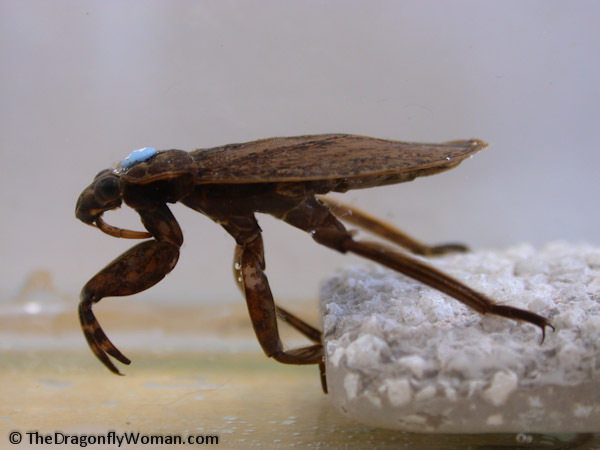 Last week I covered some of my research with giant water bugs and described how one species, Abedus herberti, breathes. Respiration in this species is a fairly simple matter of going to the surface to collect a bubble of air that the bugs carry with them underwater, then using that air store as a source of oxygen while submerged. By adding two simple behaviors, gaping and dynamic gaping, the bugs can dramatically increase the length of time they can remain submerged. If you observe these behaviors and know a little something about aquatic insect respiration, it seems clear that these behaviors have some respiratory function. However, that’s not good enough for science! You have to provide evidence that a behavior does what you say it does. So, today I’m going to finish the A. herberti respiration story. First I’ll share the condition in which the bugs exhibit gaping and dynamic gaping and I’ll finish up by sharing how I know that these are indeed respiratory behaviors. When you observe A. herberti in ideal conditions in the field, you notice that they prefer to stay within a few inches of the surface, usually holding onto the rocks along the banks of streams. They simply climb up the rocks and stick their air straps out to collect air, then crawl back down. This way they remain out of sight of predators, but still have easy access to the surface. However, not all bugs are in this sort of ideal environment. Some bugs need to dive further into the water to find a suitable perch, and they fight against the air bubble they carry the whole way down. With these observations in mind, you could imagine that bugs that can reach the surface easily might never use gaping and dynamic gaping. Bugs in deeper water, however, might want to stay underwater as long as possible because surfacing is hard work. If gaping and dynamic gaping are respiratory behaviors, you might expect bugs in deeper water to exhibit them more often than bugs in shallow water. To test this idea, I did an experiment where I placed bugs in observation tanks filled with water to three different depths. In the shallow treatment, the bugs could reach the surface easily without letting go of the substrate. In the mid-depth treatment, the surface was just out of reach of the bugs as they did their surfacing behavior and they were forced to float to the surface. The deep treatment tanks contained water deep enough that the bugs were well out of reach of the surface. I placed bugs in the tanks one at a time and observed the behaviors of several bugs in each depth before comparing the treatments. I learned that bugs forced to release their hold on the bottom are much more likely to use gaping and dynamic gaping than bugs that can reach the surface without letting go. A few bugs in the shallow treatment gaped and one dynamically gaped, but the behaviors were rare. Nearly every bug in the deep water gaped and dynamically gaped though, as did most of the mid-depth bugs. Thus, bugs forced to float to the surface and then swim back to the bottom are more likely to express both gaping and dynamic gaping than bugs that can reach the surface easily. Most likely, gaping and dynamic gaping require less energy than surfacing, so they do these behaviors to cut down on the number of trips to the surface they must make in deep water. Once I established that water depth played a role in gaping and dynamic gaping, I set out to collect evidence that these behaviors were respiratory behaviors. I did two tests. In the first, I divided several bugs into two groups. I taped the wings to the abdomen using waterproof tape in the first group, preventing them from dynamically gaping or gaping. In the second group, I added the same amount of tape, but cut the strips in half so that they could do both behaviors. I then tested both groups to see how long they could stay underwater by forcing them to stay submerged until they showed signs of stress. I measured the length of time the bugs remained underwater before becoming stressed and the time spent gaping and dynamically gaping. The next day, I did it all again, except I reversed the treatments. With this experiment I learned that when denied access to the surface, nearly all bugs exhibited both gaping and dynamic gaping when free to do so. The bugs were also able to remain underwater over three times as long when they could perform gaping and dynamic gaping than when they could not. 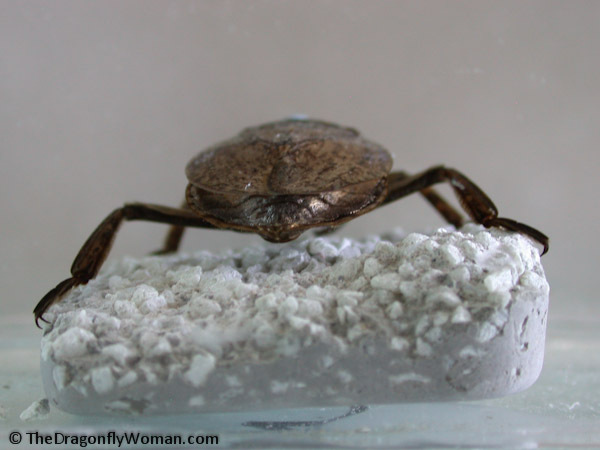 This suggested that there was a respiratory purpose to the behavior, that bugs were able to absorb oxygen into the air store from the water when exposed and extend the length of time they could remain submerged. That is, they were using the air store as a physical gill. To strengthen the evidence for a respiratory role for the behaviors even more, I did one final experiment. I once again forced the bugs to remain submerged until they showed stress, but allowed all bugs to perform gaping and dynamic gaping freely. I then altered the oxygen content of the water by bubbling air (adds oxygen) or nitrogen (removes oxygen) through a tank for 15 minutes before adding a bug. I divided the bugs and put half in the oxygen treatment and half in the nitrogen treatment the first day one at a time, then reversed the treatments the following day. Then I compared the time submerged, gaping, and dynamically between treatments. The results were clear: bugs in high oxygen water can remain submerged 10 times longer than bugs in low oxygen water. 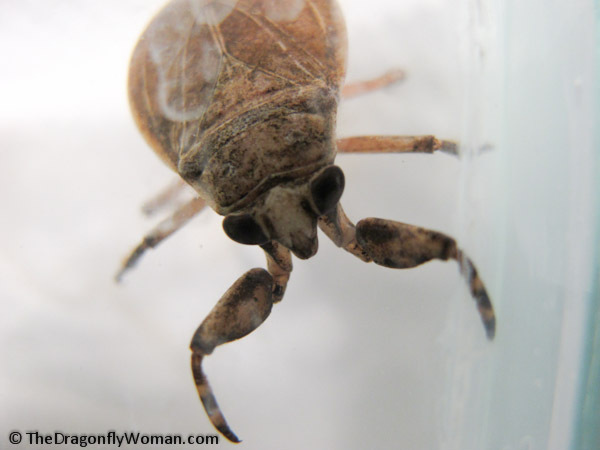 Bugs that could freely gape and dynamically gape could only remain submerged a few minutes in the low oxygen, nitrogen treated water while bugs in the high oxygen, air treated water were able to remain submerged nearly an hour. Clearly, the air store is acting as a physical gill. Bugs in low oxygen water weren’t able to remain submerged longer than bugs that were prevented from gaping and dynamically gaping entirely. In both cases, the air store was unable to absorb oxygen from the water. Bugs in the high oxygen water, however, were able to remain underwater much longer, strong evidence that the air store does act as a physical gill and absorbs oxygen from the environment when it is exposed to water. 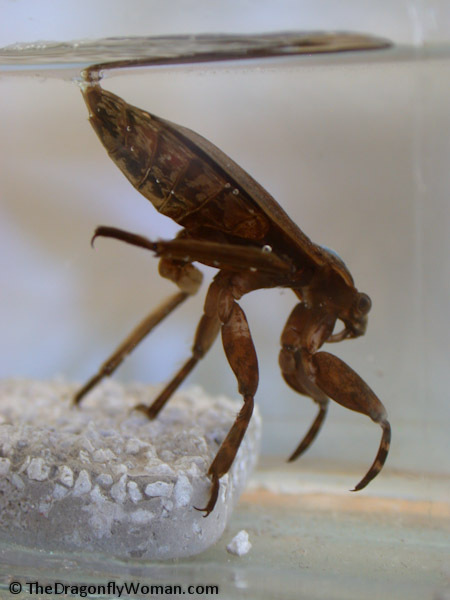 So, the giant water bug Abedus herberti depends on oxygen at the surface, but it can extend the length of time the air store provides oxygen underwater by using two simple behaviors: gaping and dynamic gaping. I think it’s amazing that two seemingly insignificant behaviors, these tiny little movements, are capable of doing so much for these bugs. This sort of thing is why I love being a biologist! Isn’t nature marvelous? That’s really neat! Was this experiment a main part of your PhD dissertation, or a side project that you explored? It’s a chapter in my dissertation, but my dissertation is a seemingly random assortment of projects that are highly interdisciplinary. I’m mixing behavior, physiology, and morphology experiments to explain why giant water bug eggs need to be brooded. This project set a baseline for another behavioral project with brooding males, so it’s not directly related to the egg work, but important for the egg work. I’m happy I was able to provide a mental break for you! And thanks for the mention. It is very sweet. It was very cool reading about your experiments! I learned that the experiments supported gaping and dynamic gaping as parts of respiration. 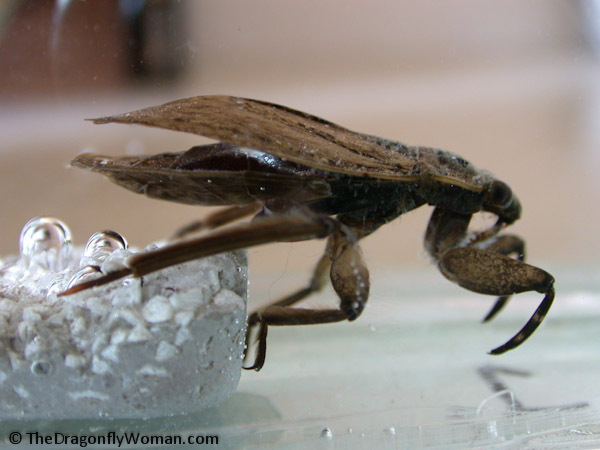 It was interesting how the environment and amount of oxygen played a role in the giant water bugs breathing habits. These creatures are simply fascinating! !